Reading of Al-Mushaf Al-Murattal of Ruways from Yaqub Al-Hadrami by Sheikh Yasir Al-Mazrui. Sheikh Yasir Al-Mazrui is one of the biggest students of Sheikh Muhammad Bin Jarah; he is the Quran reader’s “Musnid”. He has numerous nicknames, and Sheikh Ali Bin Mubarak wrote beautiful verses of poetry about him. 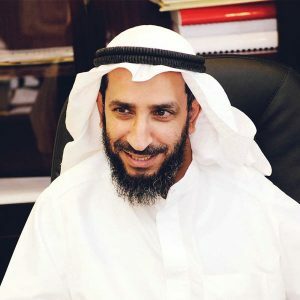 Sheikh Yasir devoted his entire life to learn and to teach the Quran, and he is considered a very knowledgeable person in Kuwait, as he is certified by several famous Sheikhs. He reads according to Hafs `An Assem’s recitation method, and he earned a certification according to the “Fourteen readings” . Throughout his career, he held several positions, as he was a general director of the public authority of the printings and publications of the Quran, the Sunnah, and its sciences, which is an organization that was founded in order to help promote and share the holy Quran. He is currently an Imam in “Al Souhoul” mosque in Kuwait. As it was noted in the beginning, Sheikh Yasir had a strong will and interest to teach the Quran, simplify its sciences, and help share the readings rules. He was able to accomplish this by writing several books, such as: “the Quranic closing Du`a’ of several Sheikhs”, “the sincerity of the intention in the sequenced Hadith by priority”, “the summary of the Tajweed of Sheikh Umar Asem Al Azmiri”, “Al Ikhwan masterpiece of the Tajweed of sheikh Hassan Al Shaeer”, etc.